It started with a love of animals. Then a strong instinct for survival. It became the White Mountains Ranch. Since the Jamestown settlers planted their first crops 400 years ago, farming has been central to the spirit of America. Times have changed, but the need for well-managed farms has not diminished, and our agricultural legacy is worth preserving. Currently, in the United States, less than 2% of people produce and supply food for the entire population! It's time we get back to our roots and create a sustainable future for all. We use all-natural methods to produce happy and healthy free-range poultry and livestock without the use of antibiotics, growth hormones, pesticides, or grow-lights. Our small operation allows us to produce a limited quantity with exceptional quality. An important part of our small and local philosophy is encouraging and promoting local, sustainable agriculture. We keep permanent flocks & herds here on the homestead, and sell the extra eggs, animals, and produce. All the animals here are treated humanely and have plenty of room to run, stretch, scratch, and entertain themselves, which eliminates stress and illness for all. They are provided with comfortable housing for nighttime safety, and four wonderful Livestock Guardian Dogs to watch over them. All of our animals are raised and processed by hand, naturally and compassionately. Slaughter time is not something anyone truly looks forward to, but it is a necessary element in a back-to-basics lifestyle. In order to get the meat you raised, you have to do "the dirty work". Fortunately, rabbits, chickens, and poultry are some of the easiest and least messy animals to butcher. It can be difficult to overcome the 21st century way of thinking; that slaughter is cruel. However, one of the greatest benefits of the back-to-basic style of livestock care is that cruelty doesn’t enter the picture. The job is handled in the cleanest, most humane way possible. By raising animals with care, attention, and the best food and environment possible, we give them lives that are stress-free and enjoyable. When it is time for them to provide food for our tables, the methods used are humane and as painless as possible. 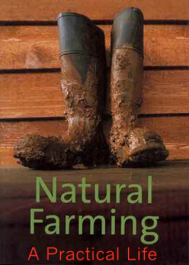 For many homesteaders and followers of a back-to-basic lifestyle, knowing where your food comes from, ensuring it is chemical free, and knowing that your livestock is cared for in the proper way, is vital to the way of life you are trying to achieve.